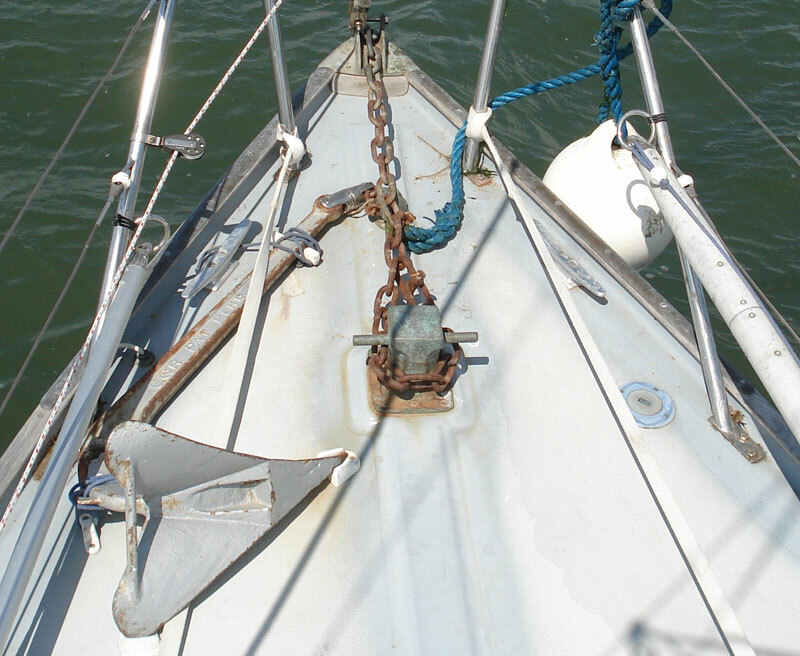 Lottie came equipped with a smallish Danforth-style anchor (about 15 lbs or 6kg) which stowed on the foredeck on tailor-made bronze chocks (click picture to enlarge). She also had about 90 feet of quarter inch chain which is mostly good though the end that lives outside the hawse pipe is a bit rusty. The Danforth’s galvanizing had also seen better days and had already been painted with silver Hammerite which was wearing off. 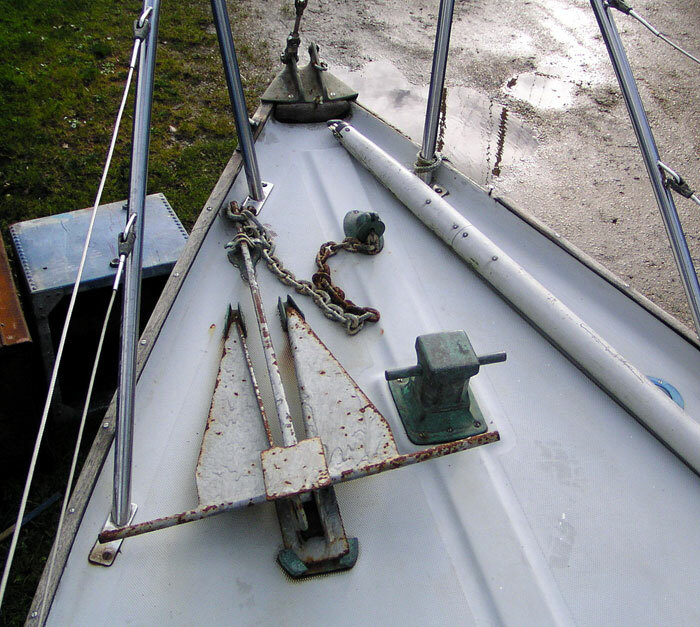 This anchor was repainted with Hammerite and stowed in the starboard cockpit locker as a potential kedge anchor. The little bronze cleats that housed it on the foredeck sold very well on e-bay! An 8lb Danforth – presumably meant as Lottie’s kedge – was ditched. The 15lb Danforth was replaced as main bower anchor first with a new 9kg (20lb) welded plough and then with a 25lb CQR plough bought secondhand for £25. It was old and again the galvanizing had seen better days but it was a genuine forged CQR. It is in need of a thorough de-rust and cold galvanising treatment unless we can get it properly hot-dipped again (along with the chain). 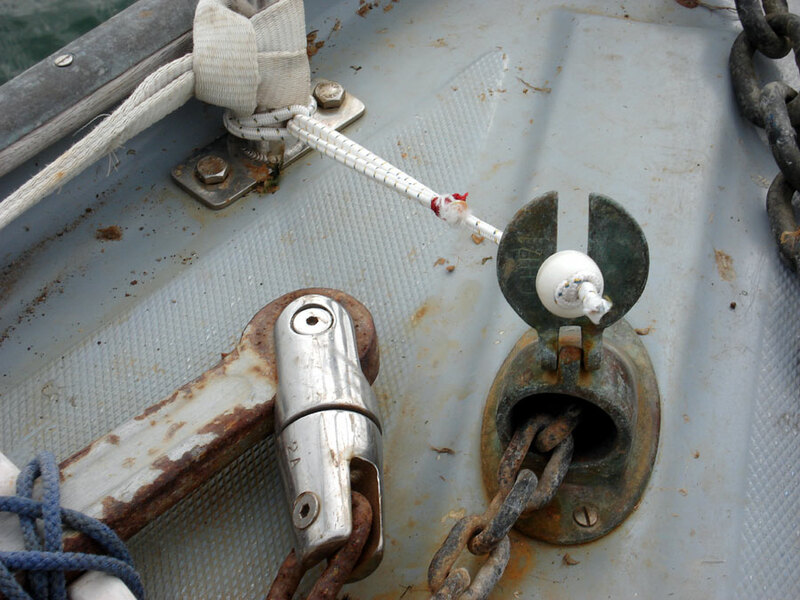 The CQR now sits on the foredeck on purpose-made white nylon CQR chocks which were surprisingly difficult to source (we eventually tracked a set down at the Chandlery Barge at Bursledon in 2004 and haven’t seen any since). The original equipment for the Trident was a 20lb CQR and arguably the 25lb model is overkill. But we have always sailed with the biggest anchor we can comfortably handle singlehanded and we sleep sound at anchor whatever the wind does. The only problem we have with it is getting it out of the mud the next morning sometimes after a blow! In addition to the original 15lb Danforth, we also have the 9kg (20lb) fabricated plough – bought new for £29 – and a 7kg Bruce-style claw anchor to choose from as kedges. Another 90 feet of quarter inch chain stowed in a plastic container mostly serves as additional ballast in the forepeak (we currently have no water tank fitted). Ideally, we would like to join the two lengths of chain together to provide a longer scope in the chain locker but have yet to find a joining link in which we feel sufficient confidence. The chain self-stows quite well when hauled in hand over hand above the hawse pipe. A plastic bead on a bit of elastic bungee cord holds the rear-facing hawse pipe lid open. The bungee is attached to the forward leg of the pulpit. Chain lengths are marked with nylon cable ties of various colours. The system of colour coding is so intricate that nobody can remember what it means any more but there are three large orange ties just before the last of the chain whips out of the hawse pipe and disappears over the bows!